If you leave milk to stand (real milk that is, full-fat, coming straight from the cow), after a while small droplets of fat float to the top, they come together and create the fat part of the milk: cream. 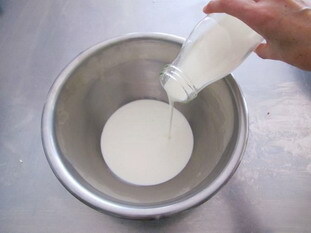 Pouring cream, ("fleurette" in French): this is the classic cream from the top of the milk. Crème fraiche: a cream which has undergone a brief lactic fermentation, which makes it thicker and slightly sour. To these two kinds can be added UHT cream, which has been sterilised at high temperature. Crème fraiche (sold in pots) and fresh liquid cream (sold in small bottles or cartons) should be stored in the fridge, for a limited time. If they are UHT, these creams (sold in cartons) can be stored out of the fridge until they are opened, . "Full" cream means without any fat removed, so it's real cream. Beware of all the "light", "reduced fat" or other creams of this type. In order to produce them, manufacturers need to replace the fat they remove with something else to keep the creamy texture, and this other additive is not necessarily good for your health. Crème fraiche is the cream of choise for sauces, but this is not an obligation. Fresh pouring cream is perfect for everything like whipped cream or chantilly. You will surely notice that UHT creams have less flavour than fresh ones, because the sterilisation leaves them bland.